The Baltimore Ravens' Super Bowl-winning season is brought to life in "Storybook Season." With over 150 vibrant, color photographs, together with extensive coverage by the Ravens' hometown newspaper, The Baltimore Sun, "Storybook Season" is a must-have for every football fan, and certainly every Baltimore Ravens' fan. Complete with per-game season statistics, it just doesn't get any better than this! Tom Matte's Tales from the Baltimore Ravens Sideline examines the history of the Baltimore football franchise since their move from Cleveland to Baltimore in 1996. The book chronicles how the team built itself into the champions of Super Bowl XXXV with what many believe to have been the National Football League's best defense of all time. Former Baltimore football great Tom Matte also details how Ray Lewis became the league's best defender, how Brian Billick became one of the best known coaches, how the team rebuilt itself after the Super Bowl to be a good team once again, and how they have become the most popular sports franchise in Baltimore. 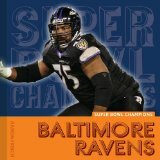 Book Description: - The Baltimore Ravens' Super Bowl-winning season is brought to life in "Storybook Season." With over 150 vibrant, color photographs, together with extensive coverage by the Ravens' hometown newspaper, The Baltimore Sun, "Storybook Season" is a must-have for every football fan, and certainly every Baltimore Ravens' fan. Complete with per-game season statistics, it just doesn't get any better than this!